We mentioned the Ian Fleming and James Bond exhibition at the Imperial War Museum some months back, but we didn’t mention the merchandise that came with it – including these classic James Bond movie poster reprints. 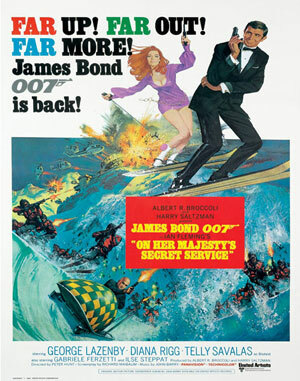 All are exact reprints of original posters, covering just about every James Bond classic, including our favourite – On Her Majesty’s Secret Service. Sized at 24 x 36 inches, it features a typically wacky 60s design, complete with ‘Far Up! Far Out! Far More!’ slogan. And at just £4.99, it’s at least £700 cheaper than an original. Follow the link for this and all the other Bond posters available.